In a column in September about Connecticut’s budget woes, Matt Walter, executive director of the State Government Leadership Foundation, urged the governor to endorse changes to state-employee union benefits. 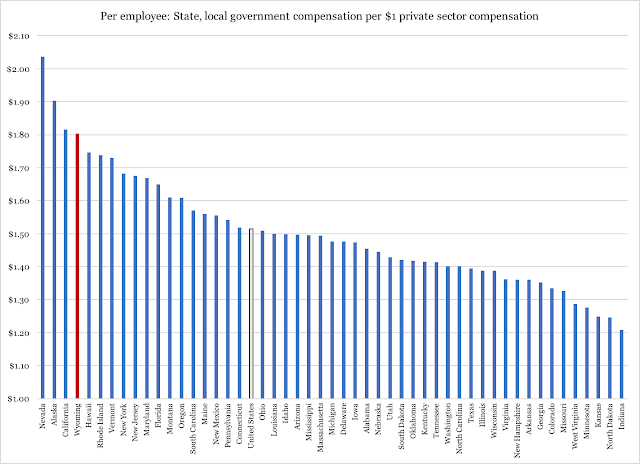 According to Walter, "Connecticut is extremely generous with its employees, who earn 42 percent more on average than the average private-sector worker in the state — the highest disparity in the country." Is Walter correct? Do Connecticut state employees earn 42 percent more, on average, than private-sector workers in the state? Is that the highest disparity in the country? shows that, on average, total state employee compensation was 48.6 percent higher than average private sector compensation in Connecticut in 2016. However, the average total compensation differential by state ranged from a 24.1 percent low (Indiana) to a 72.1 percent high (Alaska). Connecticut's differential was effectively the median (48.3 percent). calculated the average state government compensation by dividing the state government compensation by the number of state government jobs. (Federal and local government workers and military personnel were not included.) Ballotpedia calculated private-sector compensation by: (1) subtracting Government and government enterprises compensation and jobs from the total compensation of employees and jobs and (2) dividing compensation by the number of jobs. The problem with this method is that the government enterprise subsector gets stuck in a limbo. It is not added to the private sector, nor is it calculated as government. Unfortunately, as per standard national accounts definitions, government enterprises must belong to one or the other. Since they are, by definition, government entities, the only logical conclusion is that they are included under government. Without leading this discussion onto a technical sidetrack, let me just add one more reason why we should count government enterprises as government: they are sometimes used by government as a way to obscure, tuck away or otherwise change government operations for purposes that are not necessarily consistent with voters' intentions behind approving a large government. A government enterprise can replace standard agency operations if, for example, that means government is shielded from transparency. This is not to say all government enterprises serve this particular purpose. Another reason can be to be able to offer more competitive compensation to key employees, outside of union contracts and other regulatory hurdles. However, regardless of the motive behind government enterprises, they must be counted as part of government in order for us to get a proper view of government compensation (and size in general) vs. the private sector. In every state, the average state or local government worker earns at least $1.21 per $1.00 earned by the average private-sector worker. The Connecticut number is $1.52, while in Wyoming the earnings discrepancy is $1.80. The highest discrepancy is $2.04, in Nevada. The Connecticut number is $1.64. Connecticut comes in at $1.46. As for Wyoming, we can note that we are in the top five when it comes to compensation discrepancy. When we pair this with the fact that we have the highest government employment ratio in the country, we are once again back to one of the structural problems in our state's economy: too much government, too little private sector to pay for it.